The photos above are of Chris Cunico - Raton, New Mexico. 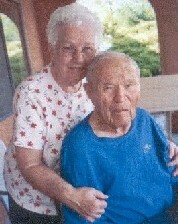 In 2004 he was 90 years young. Sadly, Chris passed 25 Nov 2007. Crist Cunico - A story about Crist Cunico growing up in the mining towns around Sopris, CO..
Carlos Alberto Creato - An article about Cunico's in Brazil from "Veneti nel Mondo". Angelo Vicenza News2 - Another article about Angelo's ties to Brazil titled "La Storia" from "Il Giornale di Vicenza". 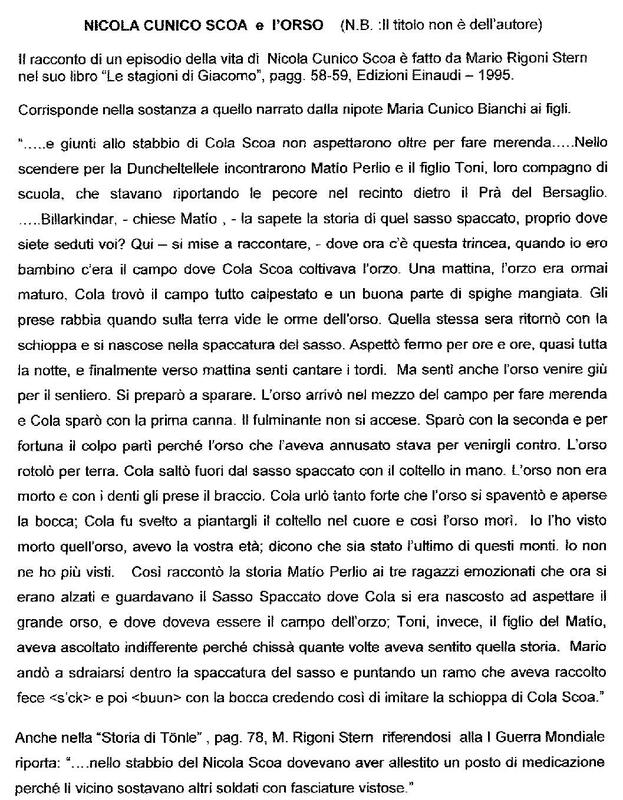 The Bear Story - A story about Nicolo (Nicola) Cunico Scoa's encounter with a bear from a book called "Le Stagioni di Giacomo" authored by Mario Rigoni Stern. Read articles and newspaper clips about your "Cunico Cousins" here! If you have a "Cunico Story" to share, just email me. Sadly, Chris left us November 24, 2007. He was truly the patriarch of the New Mexico Cunico's. Chris was an inspiration to all of us, and he will be sorely missed. 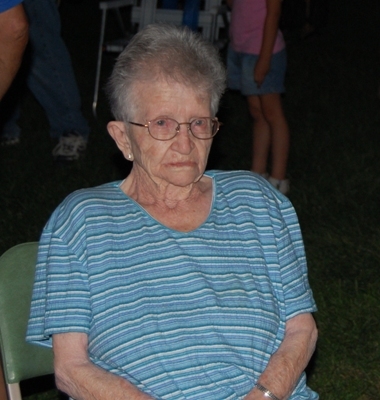 On 29 Dec 2011, Eva (Cunico) Hargrove will be 100 years young! Eva was born 29 Dec 1911 in Van Houten, NM to Giuseppe Francesco (Joe) Cunico and Marcolina Maria Rigoni. Eva married John Acie Bullard on 28 Oct 1939 in Mosquero NM. He was born 25 Dec 1908 in Waco TX, and died 18 Apr 1972 in Denver CO.
She married George Hargrove who died in Denver. This photo was taken at our 2007 CUNICO Reunion in Raton, New Mexico. Serenissima Republic of Veneto Year 1796,1798,1805,1814, Veneto invasion from Napoleone Bonaparte. Napoleon invaded the Veneto region and stolen every kind of things that had value like furniture, some that belonged to churches, jewelers, 40 million in gold coins, he imposed so many taxes to the Veneto Region that people could not eat because of all these taxes. He forced the Veneti to join the military and go to fight in Russia. 27,000 soldiers left and only 1,000 come back home alive. The people were fighting against the French, especially during the summer of 1809 due to the tax they imposed on wheat. After Napoleon lost the war in Russia he finally left Vicenza and between 1814 and 1815 Vicenza went through one of the worst shortage of the history. Napoleon gave us "as a gift" to Austria until 1866, when with fake elections we belonged to ITALY. The King had the strongest Army in Europe, but he did not anything to improve hospitals, schools or factories. At that time there were a lot of Veneti that decided to immigrate to USA, Argentina and Brasil because in these countries they could find jobs. In 1870 a lot of them left and among them there was my grandfather Angelo. He was born in 1869 in Valmarana, a little town 2 Km from Vicenza. He left when he was 17 to join the military, he was actually one of the king's guard part of "Carabinieri" . He stayed in Parma for 4 years, they raise his rank and he was transfer to Rome. He was the station commander of a little town name San Giovanni Campano. He taught to the majority of the young people in that little town to read and write. He started dated a local girl, but laws for Carabinieri dating local girls were very strict. To get married they had to do 8 years of service and be 28 years old. When his commander find out that he had a girlfriend he transferred him to Rome. His girlfriend started asking for him and she find out he was in Rome. She left he town went to Rome to meet him and let him know she was pregnant. He told here he did not has enough years of service to married her and if his commander would find that out he would get in trouble. He told her he would quit, so "after you'll have the baby you came to Vicenza". That's what she did. The baby was born in 1893 in Rome and they got married in Altavilla Vicentina in 1894. From a friend he found out that in Brasil they were looking for workers and they would pay their trip. He talked to his family and they all agreed it was the best thing to do. After a month they left from Genoa with the boat called Mafalda. They cross the ocean looking for a better future. After 25 days they arrived in Santos. They left for the coffee plantation where they were supposed to work. The trip lasted almost 200 km in a carriage. The guy who was driving the carriage told my grandfather that if he'll ended up in that plantation the owner will get them all slaves. During the night my grandfather and his family run away. They walked several miles until they saw a "fazenda" they knock at the door and they asked if they were looking for farmers and they said yeas. They started working in that "fazenda" in Capivari. The next day another carriage full of workers arrived from San Paolo. The owner of the fazenda had a meeting with everybody. He asked who was able to read and write. My grandfather Angelo was the only one. The owner was surprised that my grandfather with all his skills ended up in Brasil so he asked him why and my grandfather told him the story when he was in the military. After a year that he was working in that fazenda he was in charge of the plantation. Every morning he would have meeting with the farmers to let them know what they were supposed to do. The family started growing in 1896 another daughter was born Quintillia, in 1898 Ettore, in 1899 Maria, in 1900 Jole but she died when she was very little. Years went by and my grandfather started gained a lot of weight, he went to the doctor who told him if he wanted to get better he had to go back to Italy. It was the year 1903, my grandmother was pregnant, they left Santos and they arrived in Genoa. On May she gave birth to Oreste, my father. With the money he earned in Brasil, he bought some land in Altavilla and he started building a big house. The kids were growing and they all had jobs in construction. They moved to Vicenza (in the same house where I live right now). My grandfather died in 1938. He was 69 years old. I never meet him since I was born in 1941. That's what happen in the Veneto after Napoleone's invasion, people were forced to immigrate to other countries. Many times I feel more Veneto then Italian.